In this poignant and inspiring memoir, a beloved high school English teacher with terminal brain cancer undertakes a cross-country journey to reunite with his former students in order to find out if he made a difference in their lives, discovering along the way what is truly important in life. 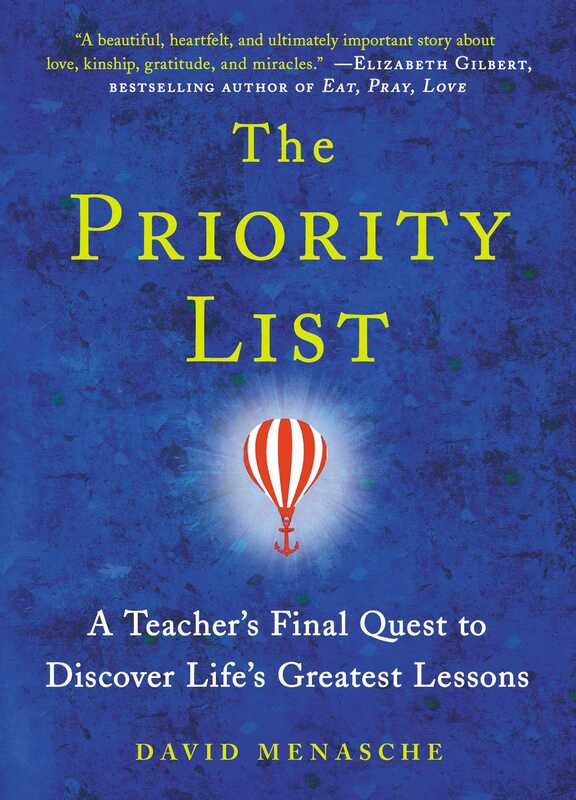 Based on a beloved teacher’s most popular lesson, The Priority List is a bold, inspirational story of learning, love, and legacy that challenges us to ask: What truly matters in life? David Menasche lived for his work as a high school English teacher. His passion inspired his students, and between lessons on Shakespeare and sentence structure, he forged a unique bond with his kids, buoying them through personal struggles while sharing valuable life lessons. When a six-year battle with brain cancer ultimately stole David’s vision, memory, mobility, and—most tragically of all—his ability to continue teaching, he was devastated by the thought that he would no longer have the chance to impact his students’ lives each day. But teaching is something Menasche just couldn’t quit. Undaunted by the difficult road ahead of him, he decided to end his treatments and make life his classroom. Cancer had robbed him of his past and would most certainly take his future; he wouldn’t allow it to steal his present. He turned to Facebook with an audacious plan: a journey across America— by bus, by train, by red-tipped cane—in hopes of seeing firsthand how his kids were faring in life. Had he made a difference? Within forty-eight hours of posting, former students in more than fifty cities replied with offers of support and shelter. Traveling more than eight thousand miles from Miami to New York, to America’s heartland and San Francisco’s Golden Gate, and visiting hundreds of his students, David’s fearless journey explores the things we all want and need out of life—family, security, independence, love, adventure—and forces us to stop to consider our own Priority List. This reading group guide for The Priority List includes an introduction, discussion questions, ideas for enhancing your book club, and a Q&A with author David Menasche. The suggested questions are intended to help your reading group find new and interesting angles and topics for your discussion. We hope that these ideas will enrich your conversation and increase your enjoyment of the book. At thirty-four years old, teacher David Menasche is diagnosed with a brain tumor. It shatters his life and begins to erode his marriage, but through it all, his job and his students are his focus. Six years and three surgeries later, he suffers a catastrophic seizure that steals his vision, his memories, his mobility, and his ability to teach. Unable to do the very thing that gave his life meaning, he decides to make life his classroom and sets off on a journey across the country to visit his former students to see if he’s made a difference in their lives. The lessons he learns on the road help him to understand what truly matters in life. 1. “If only I could have frozen time” (p. 5), the author says of the moment before his diagnosis. Think about your own life. Is there a moment where you would freeze time? Is it before a good event or a bad one? Why did you choose this moment? 2. “It hadn’t been that long ago that I was a moody, defiant, reckless teenager, taking risks, breaking rules, rebelling against my parents and every other authority figure I could find” (p. 46). How do you think David’s own adolescence prepared him to relate to and teach teenagers? Do you think his teen years had any impact on the teacher he would eventually become? Why or why not? 3. Being a teacher is the central focus of David’s life—it gives his life meaning, even when he can no longer teach. On page 164, he tells one of his former students, “It’s the teacher’s job to make the kids care enough to want to do well.” Do you agree with this definition of a teacher’s job? Why or why not? Did you have a teacher who made you care this much? 4. Throughout the book, the author quotes people who have inspired him, from Walt Whitman to Edna St. Vincent Millay to Harper Lee to Virginia Woolf. Did any of these quotations resonate with you? Which ones? 5. A memoir is, by its very nature, one person’s story, with the parts they wish to tell carefully chosen. Do you think this is a successful memoir? Why or why not? Why do you think the author chose to focus on certain aspects of his life over others? Are there particular characters whose voices you wished came out more? 6. After his first surgery, David says the doctors thought it was his treatments that were keeping him alive, but he knew it was his students who were “my life force, my breath, the blood running through my veins” (p. 87). Who do you think is right? 7. “I had found my own cancer cure: be healthy, be happy, and have a sense or purpose. It didn’t matter how long it lasted” (p. 113). What do you think about this statement? Is it a lesson other patients can take to heart? Is it meant to be? 8. David is prepared to die on his journey when he sets off, leaving his deteriorating marriage and the career he can no longer perform behind. Is there any way to read his trip as a way to avoid other problems going on in his life? Do you see it that way? Why or why not? 9. What do you think of the notes from the author’s students at the end of each chapter? 10. Discuss the different definitions of love explored in chapter 24. Do any of these resonate with you? Which do you agree with the most? How do you read them in light of what we later learn about the author’s own faltering marriage? 11. In the coda, guidance counselor (and former student of David Menasche’s) Kara Trucchio writes that “Teaching was not his ‘job,’ it was his passion” (p. 219). What is your passion? What are you doing to pursue it? What could you be doing? David always encouraged his students to pursue careers that represented what they cared about. Do you think he succeeded? 12. “What had begun as an exercise in literature had evolved into a life lesson” (p. 71). Do you find this to be true in the study of literature more often than not? How do the best books shape us and change our thinking? Has this book affected how you think about your own life? 13. Do you think this book has a happy ending? Why or why not? 1. Look at the Priority List on page 225. Rank the words, just as David had his class do. Discuss the results with your book club. How similar are your lists? Where are the differences? Do you think your list would have looked different if you had done this exercise in high school? Are you living in a way that reflects your priorities? If not, where can you make changes? 2. Think about which teacher most impacted your life. Share who those people are and why they had such a powerful effect. If possible, take some time this week to reconnect with your teacher and thank them for the influence they had on your life. 3. David talks a lot about the books that have impacted his life, including but by no means limited to Jack Kerouac’s On the Road, Ken Kesey’s One Flew Over the Cuckoo’s Nest, Mark Twain’s The Adventures of Huckleberry Finn, John Kennedy Toole’s A Confederacy of Dunces, and Anthony Burgess’s A Clockwork Orange. For your next meeting, pick one of the books mentioned in this story and see if you can understand why David loves it. A Conversation with David Menasche What was your process for writing this book? Considering your physical limitations at the time of your trip, it must have been arduous. Did you work with a writer? What was that experience like? While I was traveling, I used my phone to record conversations; take pictures; and, using voice recognition, take notes on my daily experiences. Because I was staying on people’s couches in the middle of their living rooms and the midst of their daily lives, often with small children and pets running around, finding the time to write was difficult. I would try to organize the material I had gathered in ten or fifteen minutes of peace, or on the train rides in between my stops. While traveling, I wasn’t trying to write a book—I was trying to live actively and have memorable experiences with hopes of later pulling my material together into a unified narrative. Ultimately, it was the need to pull the book together that got me off of the road. After four months on the road, I needed to sit still long enough to rest, reflect, and compose. It wasn’t until I settled in New Orleans that I began working in earnest to complete the book. You said that on your journey you were able to stop being the teacher and become the student. Is that an uncomfortable place for you to be? Would you say you’re still in that place? I am a restless spirit and a lifelong learner. Traveling for me was all about satisfying those traits. In many ways, I am still traveling, still learning, still striving to be the student so that I may l continue to learn and evolve with hopes that I will live long enough to pass on what I have learned to someone else one day. I suppose I am blessed or doomed, depending on your perspective, to live a life of duality—forever a student and teacher—but aren’t we all? What was the most eye-opening part of your journey? What did you learn that you didn’t expect? This is a very difficult question as I did not “expect” to learn anything specific, but I can say that the journey definitely and unexpectedly did teach me some advanced coping skills. I learned to cope with my newly acquired disabilities. I learned to cope with intense solitude, loneliness, inclement weather, struggle, and despair. This helped me to accept my circumstances and even appreciate them. Which of your students surprised you the most? Why? Considering Aaron Rawcliffe was a slovenly and rebellious teenage heavy-metal fanatic who showed up drunk to my class on the first day of school, I was certainly surprised to find out that he went on to become an ambitious and successful New York City businessman. He’s now clean-cut and wears impeccable Italian suits to work on a daily basis. You set out on this quest to find out if you made a difference in the lives of your students. What was your conclusion? Was it what you’d hoped for? I did make a difference and I am proud of the difference I made. For the most part, I found I enriched the lives of my students both with my lessons and, more unexpectedly, with the example I set as a person. What’s happened in your life since the end of your journey? What are you up to these days? How have the lessons you learned on your trip impacted how you live your life now? My prognosis and the adventures of my trip have taught me to live my life with a certain sense of urgency. I now fully understand that the only moment any of us are guaranteed is this one. Do you have any contact with Paula these days? Paula and I have maintained an amicable friendship since our divorce. Is there anything your readers can do to support brain cancer research or treatment? Are there organizations that you recommend supporting? Since completing the book, I have taken on the role as ambassador for Voices Against Brain Cancer. This is a tremendous organization that seeks to find a cure for this insidious disease and help those currently battling it. I encourage everybody to support this organization and its cause in every way they possibly can. "In an abstract way, we all know that life is short and precious. Or, at least, we THINK we know. But for David Menasche — a passionate young teacher diagnosed with terminal cancer at age 34 — that notion was anything but abstract. Filled with a wide-eyed reverence for life, he set off on an audacious journey around the country, determined to visit all his old students and speak to them (and listen to them) about the true priorities of existence. The result is a beautiful, heartfelt, and ultimately important story about love, kinship, gratitude, and miracles." "When cancer told David Menasche his teaching days were over, he told cancer: With all due respect, you don't know me very well. Writing with courage and strength, his determination to share life's lessons beyond his classroom is both inspirational and enlightening." "A lot of people could write about what they would do if they were told they only had a short time to live, but few could write as thoughtfully, and with as much honesty, as David has with The Priority List. 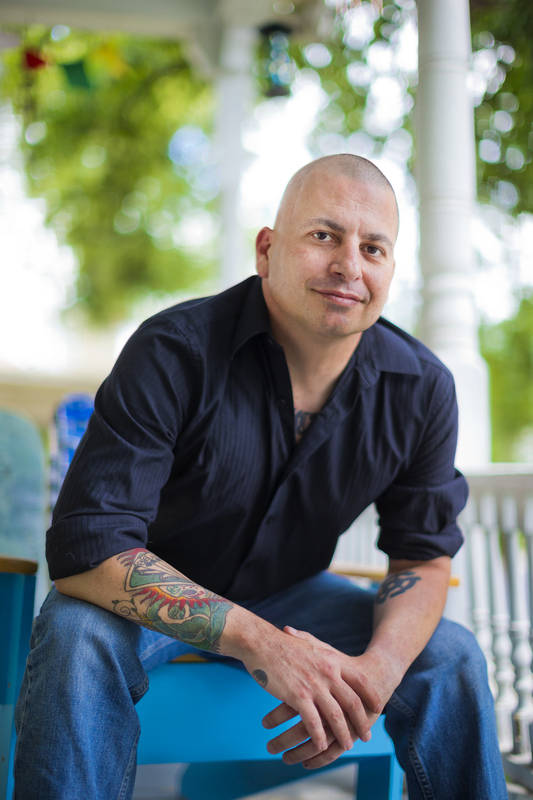 This former skate punk turned English teacher's life lessons will inspire anyone who reads them." “Within David’s journey, there are powerful lessons about how we connect to one another, and how even the smallest gestures can leave a lasting legacy. THE PRIORITY LIST is a brave and important book, which at its deepest level reminds us what it means to be human." "Like Randy Pausch's The Last Lecture, this memoir is a rousing testimony to the ways in which, in the face of death, living fully in the present moment becomes possible."